A Scottsbluff Point From The Finley Bison Kill Site. This Scottsbluff point was discovered on the Finley bison kill site sometime in the 1930's or 40's. The site is located near the town of Eden in Sweetwater County, Wyoming. The Finley site produced the first examples of Eden points. Both Eden and Scottsbluff points were excavated in situ by Harold J. Cook. The Finley site is the type site for Eden points. The spear points found on the Finley site were stemmed rather than notched. They were categorized by their flaking patterns and the shape of their edges. The points had either parallel, excurvate or straight triangular sides. The Eden points were described as having collateral or transverse pressure flaking. Their flaking pattern is deep which produces a wavy sinuous edge. The Scottsbluff points, like this example, have a smooth pressure flaked surface and they have a very straight edge. 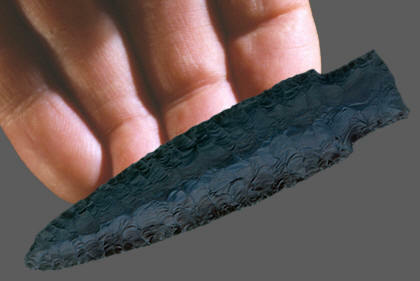 This Scottsbluff point was made from a black opaque chert and it measures 3 1/16 inches (8.1cm) long.